West Ham have ended their sponsorship deal with collapsed travel firm XL Holidays and will play at West Brom on Saturday in an unbranded kit. The Hammers have suspended all sales of replica shirts and hope to remove all branding from their Upton Park ground. West Brom do not have a shirt sponsor, so Saturday's Premier League match will see both sides in plain strips. The Hammers could face a £5m shortfall after XL went into administration on Friday, BBC Sport understands. It is understood West Ham have only received £2.5m from a three-year deal with the Sussex-based travel company. A £7.5m deal, worth £2.5m a year, was signed in February 2007 but only one year of the contract has been paid so far. Hammers chairman Bjorgolfur Gudmundsson is also one of the guarantors of a 207 million Euros (£163m) bank loan given to XL. A West Ham statement said: "In light of the circumstances surrounding the company, West Ham United have taken the decision to immediately terminate their relationship with XL Holidays. "In view of this, the club have suspended all sales of replica shirts until further notice. This will also involve in due course the removal of XL Holidays branding from all West Ham United platforms." The collapse of XL, the UK's third largest package holiday group, has left tens of thousands of Britons stranded abroad. "West Ham United will be seeking further talks with the administrators at the earliest opportunity to clarify the situation regarding the company," added the statement. "As stated, our sincere sympathies are with those XL Holidays customers and staff directly affected by today's news." Meanwhile, it emerged that Gudmundsson and his son Bjorgolfur Thor Bjorgolfsson, who is also a billionaire, became guarantors of the huge bank loan on Wednesday. The guarantee was originally provided by Icelandic shipping company Eimskip, in which Gudmundsson has an interest. 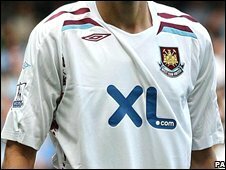 West Ham will now start the search for another shirt sponsor and wait, along with XL's other creditors, to see what administrator Kroll does with the company. A contingency plan had been built into the deal in the event of the club being relegated, with the annual payment being reduced from £2.5m if the Hammers did drop down a division.